The madness that stirs from a presidential election usually dies down shortly after election night. This year, however, in a cycle that broke away from all norms, that was not the case. In fact, it seems that only now in April, nearly five months later, the ruckus caused from the 2016 Presidential Election has quieted. Regardless of how you felt over the results, it is fairly safe to say Donald Trump’s victory on November 8th surprised everyone. Now, with the Trump Administration in full swing, LendEDU thought it would be a good idea to kick back up some of the buzz from that night in November that no one saw coming. In a new study, LendEDU has evaluated the financial health of every state that was won by President Trump and Hillary Clinton. 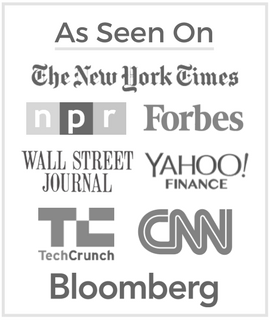 Using Experian’s Premier Aggregated Credit StatisticsSM dataset, we were able to find the average VantageScore 3.0®1 credit score for every U.S. state and the District of Columbia. Once this was completed, states were assigned a “Republican” or “Democratic” designation based on which way that state voted in the 2016 Presidential Election. Credit scores for each state in the “Republican” or “Democratic” group were aggregated together using a weighted average taking into account the population of a given state. The impact a state’s credit score had on its respective party’s average credit score was limited to the population of that state. The final results revealed the combined average credit score of the states that went to President Trump and the states taken by Mrs. Clinton on November 8th, 2016. The average VantageScore 3.0 credit score for states that went red for Donald Trump in the 2016 Presidential Election was 673. In comparison, states that went blue for Hillary Clinton posted an average credit score of 692. The average credit score of a state is a useful statistic when evaluating their economic outlook. It represents the financial health of that state’s residents. A state’s average credit score will drop if that state is experiencing rising unemployment, falling income levels, and an increase in default rates on mortgages and loans. Contrarily, if all of those economic indicators are doing the opposite then the average credit score will rise. Some interesting takeaways can be derived from the fact that the states Hillary Clinton carried posted an average credit score nearly 20 points higher than those that Donald Trump took home. First, this data on average state credit scores can at least try to help answer the question a lot of people have been asking: How did Donald Trump pull off such an astonishing victory? Perhaps, states that went red for Donald Trump had experienced the most economic hardships over the past decade. This would help explain why these states had a lower average credit score than the states carried by Hillary Clinton. So, maybe the residents of Republican states in the 2016 Presidential Election noticed their decrease in financial security and found an easy scapegoat in the Democratic Party. A quick analysis of the crucial swing states in the election reveals that this just might have been the case. In Ohio, the average state credit score fell from 690 in 2012 to 683 in 2016. In Pennsylvania, the average state credit score dropped from 700 in 2012 to 694 in 2016. In Michigan, the average state credit score lowered from 688 in 2012 to 682 in 2016. In North Carolina, the average state credit score fell from 679 in 2012 to 672 in 2016. In Florida, the average state credit score decreased from 678 in 2012 to 672 in 2016. Finally, in Iowa, the average state credit score lowered slightly from 708 in 2012 to 707 in 2016. All average state credit scores from 2012 and 2016 were pulled from Experian. It is worth mentioning that, with the exception of North Carolina (which went Republican in both cycles), all of the aforementioned states were carried by Barack Obama in 2012 and Donald Trump in 2016. With the exception of Wisconsin, every state that switched from Democratic to Republican between the 2012 and 2016 Presidential Elections experienced a decline in average state credit score. Secondly, this data takes the long-standing notion of what each party’s constituent base is supposed to look like, and flips it on its head. For decades and still to this day, the Democratic Party has been the champion of the lower middle and lower classes. Meanwhile, the Republican Party has long been associated with the wealthier upper middle and upper classes. In turn, both parties have almost always received the sweeping support of those classes they are supposedly representing. That is why it was quite surprising to see states that voted Democratic in 2016 had a better average credit score than those that voted Republican by nearly 20 points. Generally, blue states are proving to have more financially secure residents than red states. Ironically, unless there is a seismic shift in party platforms, this backward trend of the less affluent states supporting Republicans and the more fiscally privileged states supporting Democrats only figures to grow more prevalent. All data used in this study is under license from Experian and Onboard Informatics. Onboard Informatics’ dataset was used for the most recent population figures and location purposes for ZIPTM2 codes. Experian’s Premier Aggregated Credit StatisticsSM dataset was used to find the VantageScore 3.0 credit scores for given locations. To find the average credit score for each state, ZIP codes for every city in a respective state needed to be aggregated. After this was done, the average credit score for each ZIP CodeTM in a given state was weighted according to the population of that ZIP Code. ZIP codes that were more populated were given more weight in finding the average credit score for the respective state. 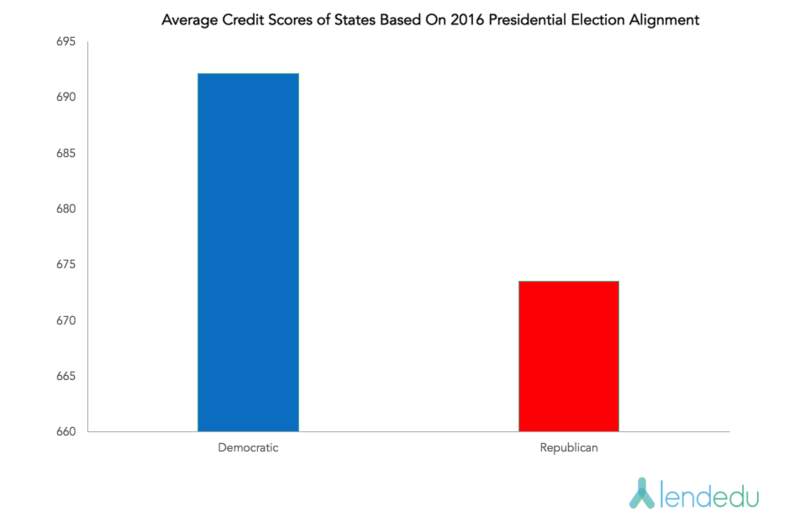 Once the average VantageScore 3.0 credit score was found for each state, states were then separated according to how they voted in the 2016 Presidential Election. States that were carried by Donald Trump were placed in the “Republican” group, while states that were carried by Hillary Clinton were placed in the “Democratic” group. The average state credit scores within these two groups were aggregated together using a weighted average taking into account state population. States with a greater population were weighted more heavily when finding the average credit score for the “Republican” and “Democratic” group.